If you have an office job, you probably spend a lot of time sitting at your desk. And with so much time spent in one place, it’s natural to want your space to reflect your style and make you feel comfortable. After all, your cubicle, office, or workspace is basically your home-away-from-home. But when it comes to decorating a space you don’t technically own, there are some do’s and don’ts. In fact, if you’re decorating is too heavy on the “don’ts,” it may be costing you your reputation. To avoid this workspace blunder, take a look at these design tips and tricks. A quick way to brighten up your desk and provide a home-like feel is to decorate with plants. But start small—you don’t want your desk to resemble a rainforest, and trying to find important files amid a jungle isn’t fun. Remember, if you’re going to bring something green to your workspace, you must be willing to take care of it. A dying plant isn’t an attractive decoration, so if your desk isn’t near a window, or you aren’t much of a gardener, consider decorating with artificial greenery instead. They’re often difficult to tell apart from real plants, but much easier to care for. Likewise, you may opt for low-maintenance plants like cacti to spruce up your space. Hanging pictures, notes, or other documents is a quick way to personalize your desk. And when you use colorful or unique magnets and clips to hang those items, you add even more style to your space in a simple and inexpensive way. Keep your desk sleek and streamlined to avoid going overboard. After all, your cubicle walls aren’t your personal Pinterest boards. Steer clear of hanging up controversial posters, phrases, or images. And don’t adorn your walls with anything political. Certifications, degrees, or other awards belong in the office, but ensure they are framed and displayed with pride. One of the quickest ways to take your desk from drab to fab is by clearing the clutter. We all have stacks of paper on our desks at some point, but heaps of documents are an obvious eyesore. Take some time to organize your papers into folders, files, binders, or drawers. If you don’t have space to hide your files, or you need to keep them out for easy access, consider displaying them in a unique way. For example, you can create bookends out of your favorite books or decorative items. Doing so will add style to your desk, and help keep it organized. 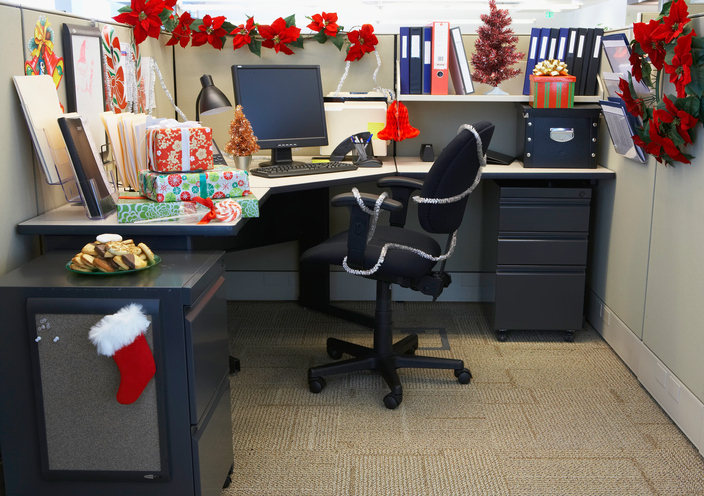 If it’s beginning to look a lot like Christmas in your home, try not to let that overlap into your workspace. It’s okay to have some decorations at your desk, but putting up a tree or motion-activated musical wreath isn’t respectful to your colleagues. As a general rule, try to keep your seasonal flair simple and quiet. If you don’t plan on finishing your food within the next hour, it’s time to let it go. Not only can food collect mold and odor, but it can also turn your desk into a cluttered mess. The same goes for those half-full coffee cups. It’s not always convenient, but make a point to wash your cups and utensils at the end of the day. Collecting moldy, coffee-crusted cups is a major decorating don’t. If you discover that your boss strongly dislikes your favorite basketball team, it might be time to take down the poster. While it’s natural to want to support your favorite sports teams or groups, if it’s going to cause bad blood with your boss, it’s best to avoid it. After all, do you really want your boss to be reminded of your differing opinion every time he or she approaches your cubicle? While it’s important to ensure that your desk is presentable, it’s equally essential to maintain presentable behavior in your workspace. Resist the temptation to clip your nails, brush your teeth, or perform other personal hygiene procedures at your desk. How do you tastefully decorate your workspace? Have you noticed any decorations that should be avoided? Let us know your tips in the comments section below!